I met up with a founder that was raising an angel round. He was actively raising, but was only having a few investor meetings a week. I mentally ran the math (# of potential investors, amount they could invest, potential conversion rate and time allocated) and there was no way he was going to close the ~$1 million round he intended. Indefinite raising is also a negative signal. Just like a house that stays on the market too long, deals get old and become increasingly less likely to close. If you need a 100% close rate to fill 75% of your round, it won’t be enough. It’s highly unlikely you’ll be able to get a 100% close rate. Many investors passed on Dropbox and Airbnb. You want to find out as fast as possible if your company is fundable or not. Consolidate all of your learnings into as short of a time period as possible, so if you’re not getting traction, you get back to work. Remember, it’s the work you do on your company that makes you more fundable - and permanently fundraising can prevent you from creating any value. If it’s obvious you’re not getting traction, stop. It’s not only a waste of time and a company that raises indefinitely is a negative signal. With > 6 months, you have a few months to raise, while also running a backup plan, which may be profitability or an acquisition. If you wait until you have 1 month left in the bank, you run a huge risk that your company will fold; if you do find investors, the terms will likely be bad because your BATNA is going under. Many founders give a range of how much they’d like to raise. For example, targeting $300 - $500k, $750k - $1m or some other target range. What founders don’t realize is that some investors consider getting to the minimum as part of the investment deal. Investors may commit, but if you’re raising $300k and only get to $200k, they might not transfer the money. If you think about it, that logic sort of makes sense, since your company will need the capital to execute on the plan you pitched. They may want the money to be held in escrow or wait until for confirmation that the minimum amount has been transferred. Other investors won’t ask and will transfer the money immediately. For those that asked us, we sent a screenshot of our bank account to confirm that we hit our minimum. Sometimes I meet founders that try to game the fundraising process. One of our advisors explained that investors are pros at fundraising. They do this all the time. Founders rarely do fundraise. 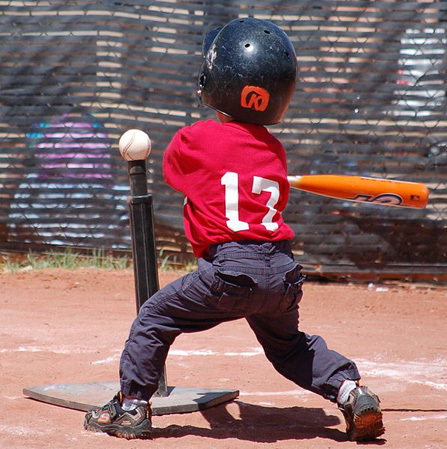 I always felt I was playing t-ball against pros - I sent that t-ball photo to one of our investors to show how it felt :). It's unlikely that you'll out game or out maneuver anyone. By trying, you may just end up burning bridges and scuttle a relationship that should be built on trust. I heard Garry Tan say something that stuck with me - Silicon Valley is a trust based ecosystem. That’s great for people that are trustworthy, not good for people that aren’t. So, be the former. There’s always the pre- launch, post launch debate on fundraising. If you're a new founder, raising pre- launch is more difficult. You can pull it off, I just think it's harder. Just know when to stop raising if it’s not working (see #2 above).